The 75,000 convicts transported to Van Diemen's Land meant not only cheap labour, British funding and parents for later generations, but also a predominance of men (only a fifth of convicts were women), rampant crime and a reputation as a land of criminals. The first two disadvantages petered out after many former convicts went to the mainland gold rushes, but the bad reputation remained, despite colonists' attempts to conquer it by changing the name of the island and many places connected with convicts, such as Port Arthur, and never mentioning in public that anyone had convict connections. The stereotype of the convict as a badly behaved drunk meant long-term infamy for Tasmania, but also meant that if ex-convicts behaved well, they could distance themselves from it. Respectable ex-convicts were allowed to live down their past without anyone mentioning it, to the extent that many later generations did not know of their convict forbears – an astonishing achievement by whole communities. Many former convicts achieved success in business, primary industry or politics, and the desire to distance oneself from any convict taint, best done by respectable behaviour, led to low crime rates. 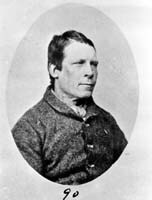 By 1900 there were claims that Tasmania had put its convict past behind it, though ardent protest at the filming of the convict novel For the term of his natural life in the 1920s showed this was not entirely the case. However, by the 1950s there was little apparent interest in convicts. Convict descent remained unmentionable until the 1970s, by which time the convict past was generations away, and current beliefs meant convicts were often more pitied than censured, or even admired as enterprising rebels. Suddenly it became a source of interest and even pride to have a convict ancestor and family history blossomed, while the convict past became a money-earner in the developing tourist industry. Given that Tasmania had the largest number of convicts per head of population, and the smallest population growth since, the island populace has probably Australia's largest percentage of people of convict descent, 40 percent in one survey. Further reading: A Alexander, 'The legacy of the convict system', THS 6/1, 1998.